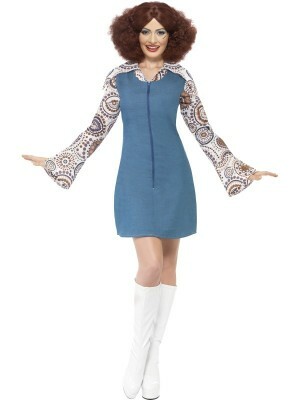 Show your love for the past decades while dressed in this Groovy Dancer costume. Great for a fun night out with your girls. Every 70s child will feel nostalgic in this beautiful short attire. Our groovy dancer costume is the ultimate choice for any fancy dress party with a disco, seventies film and musical theme. Sure to have you rocking all night long. Includes short blue dress with an attached long sleeve mock shirt. Small, medium and large sizes are all in stock.